Want to improve the productivity of your collaborative robot? 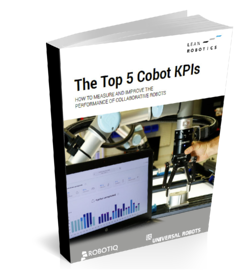 This comprehensive eBook will show you how to use cobot-specific KPIs that will allow you to improve the performance of both your robotic cell and the manufacturing line as a whole. What are KPIs and how do you apply them to robotics? Which KPI properties are important for cobots?